Economics is a broken science, living in a kind of Alice in Wonderland state believing in multiple, inconsistent, things at the same time. Prior to the financial crisis, mainstream economics argued simultaneously for small government on taxation, regulation and spending, but big government on monetary policy. After the financial crisis, economics is now arguing for more government spending and for less government spending. The premise of this book is that the internal inconsistencies between economic theories - the apparently unresolvable debates between leading economists and the incoherent policies of our governments - are symptomatic of economics being in a crisis. Specifically, in a scientific crisis. The good news is that, thanks to the work of scientist and philosopher Thomas Kuhn, we know what needs to be done to fix a scientific crisis. Moreover, there are two scientists in particular whose ideas could show how to do this for economics: Charles Darwin, the man who discovered evolution, and William Harvey, doctor to King Charles I and the first man to understand blood flow and the workings of the human heart. 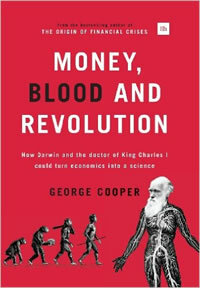 In Money, Blood and Revolution, bestselling financial writer George Cooper explains how the ideas of Darwin and Harvey could revolutionise economics, making it more scientific and understandable, and might even reveal the true origin of economic growth and inequality. Taking readers on a gripping tour of scientific revolution, social upheaval and the secrets of money and debt, this is an unmissable read for anyone curious to understand how the world really works - and the amazing future of economics.